Terrestrial animals face two common sources of heat extreme enough to pose a danger to them: Sunlight and fire. It therefore stands to reason that they would evolve systems for sensing heat and behavior making them averse to extreme levels of heat, and most terrestrial animals have indeed done so. Fish, on the other hand, live in an environment where neither of the above heat sources have a profound impact, and the one source of high temperatures underwater (geothermal activity, such as underwater volcanoes) does not exist within the habitat of many species of fish. In summary, there does not appear to be any pressure for fish to evolve or retain an aversion to heat like terrestrial animals have. Temperature affect pretty much all metabolic pathways. There are incentive in fishes as well to control their internal temperature. Control of Body temperature can be categorize along two axes, one concerning the source of heat and the other the magnitude of temperature variation. Please have a look at this post to understand the terms endo-, exo-, poikilo-, homeo- terms. 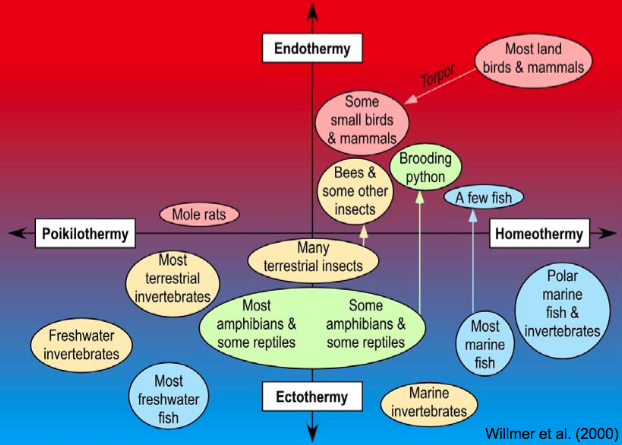 Below is a figure to give a general overview of the diversity of species in terms of temperature regulation. As you can see fishes are found in different parts of the figure. So, yes there is incentive in fishes to control their internal temperature and to avoid extreme heat as well as extreme cold. Not the answer you're looking for? Browse other questions tagged evolution behaviour sensation ichthyology or ask your own question.